TUC/MUSIC search is powered by Google. For better results please use keywords in English. Welcome to the Laboratory of Distributed Multimedia Information Systems and Applications (TUC/MUSIC). 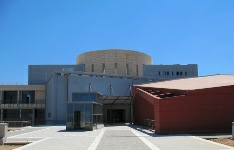 The TUC/MUSIC Laboratory was established in 1990 in the School of Electronic and Computer Engineering of the Technical University of Crete which is located in Chania, Crete, Greece. The TUC/MUSIC Laboratory is a center of research, development and teaching in the areas of distributed information systems, application engineering, computer graphics, and simulation engineering. We hope that you find the information in this site useful, and remain at your disposal for any additional information that you may want. More information can be found by following the "About TUC/MUSIC" menu option. You can also find a short presentation about TUC/MUSIC here. TUC/MUSIC has developed an FRBR-based Open Archival Information System (compatible with the OAIS reference model) that implements the TUC's Institutional Repository. Key features of this system include: the FRBR based modeling archived content, the extensible vocabulary and authority-file integration for production of Linked-Data ready metadata, the OAI,OpenSearch, and SWORD Services for programmatic content access and submission, the interoperability with national and international aggregators (OAIster, Open AIRE, etc), the tracking of content provenance, the provision of content analytics, and the extensible metadata transformation mechanisms (built-in for MODS, eFRBR, OAIDC, MARCXML). MMAT:The Multimedia Authoring Tool. A multilingual web-based management system for museums, archives and digital collections, which facilitates the authoring and metadata enrichment of Cultural Heritage Objects (CHO). It employs modules for CHO/multimedia manipulation, persistency and vocabulary management. Furthermore, it allows Museum collections to be exposed in Europeana.eu and BioCASE portals. NHM Semantic Visualizer. A demonstrator of the semantic methodology and tools that allow Museums to publish their collections to the Semantic Web and the Linked Data Cloud. The methodology includes the following stages: (a) enrichment of Natural Europe metadata, (b) conversion of metadata from XML to RDF, (c) connection of Natural Europe LOD node to the Linked Data cloud (RDF store, SPARQL endpoint), and (d) transition to EDM (Europeana Data Model). Both frameworks (infrastructure and methodologies) can be applied in other domains as well, exploiting their schemes, and related with the domain vocabularies/taxonomies. MOLE is a modern, advanced platform for supporting synchronous or asynchronous learning experiences using advanced multimedia features. The portal is the single entry point to various deployments of MOLE. You can log in the MOLE Platform by using the "guest" user account. The Website of the School of ECE aims to provide a window of information and communication among members of the school, students and staff. It also aims to connect the school with the society and especially the young people who want to study. For that, it publishes the school's news, announcements, as well as information about it's offered titles and programmes. The ECE Courses Platform is is a comprehensive course management information system, supporting course, learning, & community management for the needs of the school of Electronic and Computer Engineering at the Technical University of Crete. The system's content and functionality are accessed either guest, or as registered user. The Digital Library of Electronic & Computer Engineering school is the place you can find any kind of information regarding the research activities and research results of the school. Such information refers to Publications, R&D Projects, Diploma Works, M.Sc Theses, Ph.D Theses, Downloads, etc. The BSEC Education Portal is about Higher Education in countries around the Black Sea. Its main purpose is to enhance the collection and dissemination of information in the field of higher education and specifically in regard to the legislative, regulatory and standard framework in the field of education. eShadow is an internal research project of TUC/MUSIC. It aims to exploit the concepts of the traditional Shadow Theatre art towards eLearning and digital storytelling. Currently, we develop an Internet-based collaborative environment integrating a gesture control interface for animated shadow figures. The Alumni Website is for the ECE School the medium for continuous communication with its graduates, and a means of following up with their careers and professional development so that useful conclusions can be drawn. It is also of great importance for the School’s alumni to stay in touch.